At Jonathan Feder – Family Dentistry, “family” is the key word. Our team is a tight-knit group that truly enjoys providing the best possible care to our community. We also make it a habit to treat each and every one of our patients like family by serving you with respect and compassion, and helping you feel comfortable to express your needs and wants for your smile. We can’t wait to welcome you and your family into our own dental family! 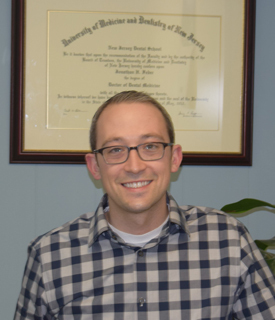 Dr. Jonathan Feder earned his DMD dental degree at the University of Medicine and Dentistry of New Jersey (now Rutgers School of Dental Medicine). While there, Dr. Feder made the Dean’s List and was inducted into Gamma Pi Delta, an honor society focused on scholarship and excellence in the field of prosthetic dentistry. After graduating, Dr. Feder completed a General Practice Residency at St. Barnabas Hospital in Bronx, NY, where he was awarded “Resident of the Year.” He is a member of the American Dental Association, Academy of General Dentistry, and New Jersey Dental Association. Dr. Feder’s main goal is to help make each patient feel comfortable and achieve their personal desired result. When not working, Dr. Feder enjoys reading, learning, and spending time with his wife, Talia, and their two kids.